Experien partner with a range of organisations that are also affiliated with the medical and dental profession. Our affiliation with these organisations allow our clients to be offered premium service, competitive pricing and exclusive offers. BOQ Specialist aim to build partnerships with their clients and have been providing specialist banking in Australia for over 20 years. Their broad range of personal and business banking options include transactional and savings accounts, credit cards, home loans, practice purchase and fit-out loans, car loans, SMSF loans and property investment loans. Their approach is characterised by responsive personal service, unconventional thinking, and an ability to be nimble, flexible and innovative. Wavelength International provides medical professionals and healthcare employers with high quality locum, contract and permanent recruitment solutions. For two decades, Prime Practice has been helping dentists run successful businesses. Built upon a rich history in the dental industry, their suite of products will help you from graduation all the way through to a successful retirement. 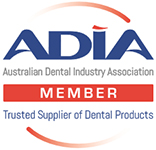 The Australian Dental Industry Association (ADIA) is the peak business organisation representing suppliers of products and services to dental professionals.